For those that wanted to get into Punkapocalyptic and maybe didn't know what crew you wanted to run with, there's a new one on the block. Or maybe you already play and still want to try out something new. Now's your chance. 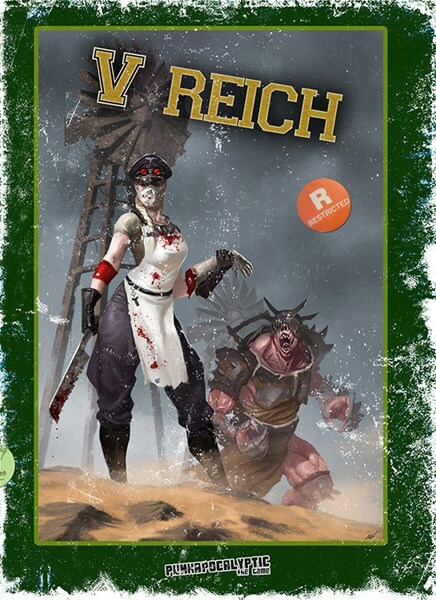 The V Reich starter set is now available. A new faction arrives to Punkapocalyptic. After the successful crowdfunding campaign last year, the V Reich are now released to the general public. Now for sale the v Reich Starter Pack, including five resin miniatures: Marshal (pistol and metallic armour), Medic (small blade / pistol), Soldat (Rifle and biohazard protection), Übersoldat (shotgun, metallic armour and biohazard protection) and Subhuman. These same miniatures are available also individually.